Fresh Wave is a company that makes a line of products to help keep your home smelling good. For my review, I was sent the odor neutralizing carpet shake, odor eliminating crystals, and the all natural odor neutralizing spray. What first attracted me to this company is the fact that my house can be smelly due to my two dachshunds. They are not fully potty trained (really working on this!) and often have accidents. I was interested in trying these products to see if they could help with this. I tried the carpet product first. Since this is where my naughty dogs use the bathroom, I wanted to rid the carpet of that smell. It worked very well! It covered up the odor well. Also, I tried the spray which was nice to be able to spray anywhere. This product has a fresh pine sort of smell. It does smell good but is pretty strong so I would recommend using it sparingly. Also, it is a manly sort of smell (in my opinion) so I think that it would be great to spray in your guy's stinky gym bag. The giveaway will be for the Fresh Wave carpet shake, crystal gel, and spray (a $39 value) to one lucky reader of The Nutritionist Reviews. The giveaway is open until Midnight on Wednesday October 5th. Winner will be chosen on Thursday October 6th using Random.org. The winner will have 48 hours to respond or a new winner will be chosen. Tell me what you would like to make smell better in your house by using these products. -Like Fresh Wave on Facebook (1 entry). -Follow Fresh Wave on Twitter (1 entry). -Follow me on my brand new Twitter page (2 entries). -Subscribe to my blog through email (1 entry). I would use this to make my kids rooms smell better. Thanks for the chance to win! I'd like to make the living room smell better. It stinks a little from the dog always being on the couch. Coming by from the Cup of Joe Blog Hop! I have dogs, too, so I know what you mean about the carpet! Would love to try it. scent be in the house from room to room when I walk into the house. I once had it, with a certain spray, but they do not sell anymore. I would love to have another great scent. I would like to try the Fresh Wave Wash. 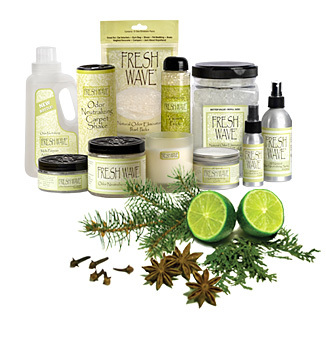 I like Fresh Wave on FB as Anne Loyd. I follow Fresh Wave on Twitter as Anneliz702. I would use it to make the livingroom NOT smell like two standard poodles! I would use Fresh Wave Carpet Shake on the rugs in our front entryway. It is a high traffic are and the rugs are always in need of freshening up. I am a fan of Fresh Wave on Facebook. I am following Fresh Wave on Twitter. Pet areas of the house could use this! Liked them on their FB! I know follow you on twitter!! btw, love a good tweet! we are already connected via google! already a subscriber of yours! signed up for the swagbucks!! i would like to make my room smell better because as an athlete, my dirty clothes and stinky clothes pile up fast! I would use them in every room, but more often in my husbands down stairs bathroom !! I'd like to try it on the skunk smell my dog left on my couch. My laundry room has a mildewy odor I would love to eliminate. I follow Fresh Wave on twitter as ptowngirl25. 1.I follow you on twitter as ptowngirl25. 2.I follow you on twitter as ptowngirl25. I like FreshWave on facebook as Janel Myers. I like The Nutritionist Reviews on facebook as Janel Myers. I entered the Snack Aisle Gift Certificate Giveaway. I entered the Every Man Jack Shave Kit giveaway. like fresh wave on facebook! I definitely would like to make the carpet smell better. Thank you for a nice contest!! Probably the basement, because it can smell a little musty. It is partially finished with a kid's area, so it would be a nice improvement! Entered your Snack Aisle giveaway. I would love my sons room to smell somewhat decent once in a while. I have 4 pets, so these would greatly help. I especially want to make my bedroom smell better. I would like to try the Carpet shake. I've tried others that don't smell so great. We have 2 dogs too. They are getting older so every once in a while they have accidents. I've been thinking about getting all of our carpets taken out and hard wood floors put in but it's so expensive. My room with the kitty litter box. We have several pets so this might help alleviate the odors! I would like my kids' rooms to smell better! I follow you on twitter as kidliterati.